Ugly Dog Adventures is a dog recreation service offering group pack adventures. We specialize in dog socialization and offer full service dog pack adventures daily. Dogs receive excellent socialization, exercise and positive training in our program. Currently, we are an exclusive service located within the City of Orange. California. 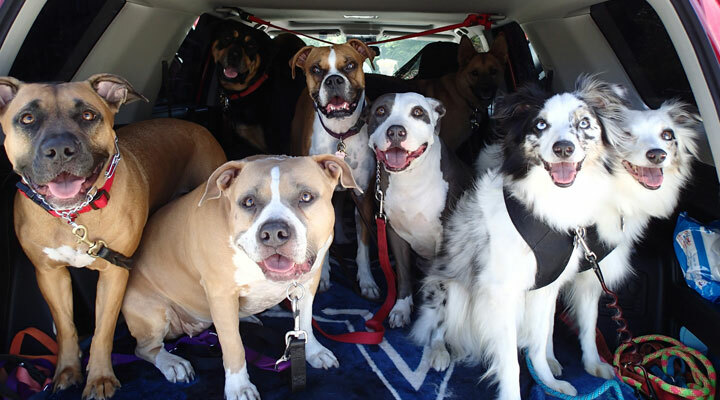 We are a social club for dogs where each member is carefully screened for suitability within the pack. Ugly Dog Adventures offers leashed pack adventures mid-day 5 days a week, Monday-Friday. Our group walks and/or hikes are 1 hour long, due to travel time dog is away 2-4 hours. Our packs consist of dogs of all ages and sizes. We normally hike 2 miles depending on the physical requirements of each pack. Pick up and drop off at your home or office is always free. Our service area includes the City of Orange and up to a 5 mile surrounding radius. We enjoy hiking at our local regional OC Parks including Irvine Park, Santiago Oaks Park, Yorba Regional Park and many various trails throughout our community. The price per adventure is $30. In addition to our signature pack adventures, we are also available to provide your dog with walks, potty breaks, boarding, daycare, overnights at your home and private training. Currently, we can only offer our additional services to clients only. Prices for these services vary on location, duration, and of course, your dog. Every decision we make is for the well-being of the pack. • We do not accept unvaccinated dogs. Proof of vaccination is required before joining our pack. • We do not accept aggressive dogs. • We do not accept backyard dogs. • We do not accept unneutered male dogs. What are the requirements to be in the pack? • Your dog must pass the initial meeting and temperament test. Your dog will have an initial meet-n-greet with one of our owners and a UDA training dog prior to acceptance into the pack. • Your dog must be at least 6 months of age. • Your dog must be able to sit with verbal command or hand cue. • Your dog must have no history of dog bites to humans or other dogs. • Your dog should be leash trained, if not we may require the use of an alternative training collar. • We require your dog to have a current county license and affixed to collar with a name tag. • Dogs must be current on all vaccinations. For all dogs over 4 months this includes DHPP, Rabies, and Bordetella. • Dogs must be free of worms and parasites. Dogs must be treated regularly for fleas and tick protection. • Your dog should be in good health. Please notify us if your dog has any medical conditions or special needs. Any changes in your dog’s health, any injuries and/or behavioral changes must be reported to us immediately. • This is a membership based program. • Commitment is on a month to month basis. • Our minimum participation requirement is 1 day per week. • Dues must be received by the 1st of each month. • Cancellations must be made 24 hours in advance or service fee applies. While we strive to enjoy pack hikes year round, we will be closed in the event of inclement weather as well as weekends and major holidays.